The Battle of Lake Erie was pivotal in the war of 1812. In September of 1813, Commodore Oliver Hazard Perry's fleet of small fighting ships defeated Britain's contingent of larger experienced war ships. A key feature of that battle was the fact that Commodore Perry's flagship Niagara was effectively shot out from under his feet, forcing him to abandon Niagara and transfer his command to her sister ship, the Lawrence, on which he would go on to lead the Americans to victory. 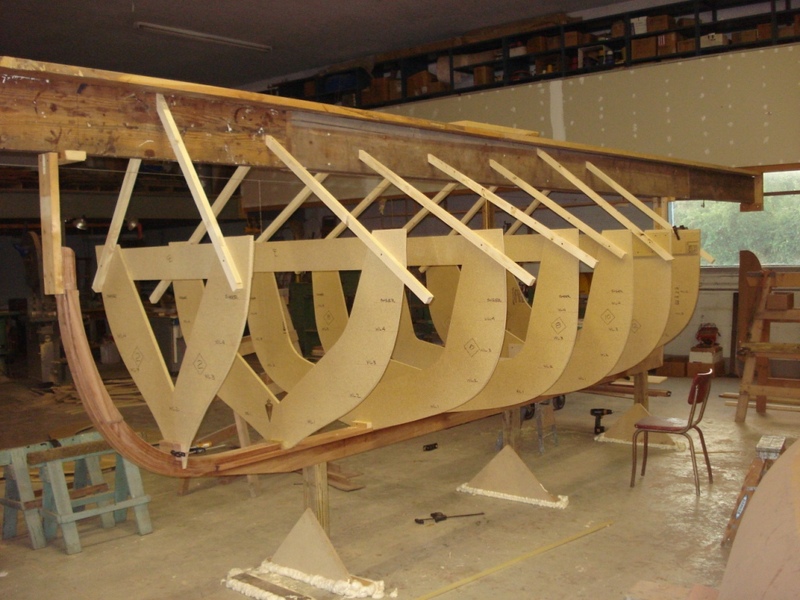 That scene was to be re-enacted in September 2013 on the 200th anniversary of the battle and we were selected to build the reproduction of the boat in which Perry made the transfer. Unfortunately, no records existed to tell us exactly what that vessel was. However, naval architect Melbourne Smith's historical knowledge of ships and boats of that era allowed him to design this "best guess" of what that boat might have been. The resulting construction process is shown in the slideshows below. 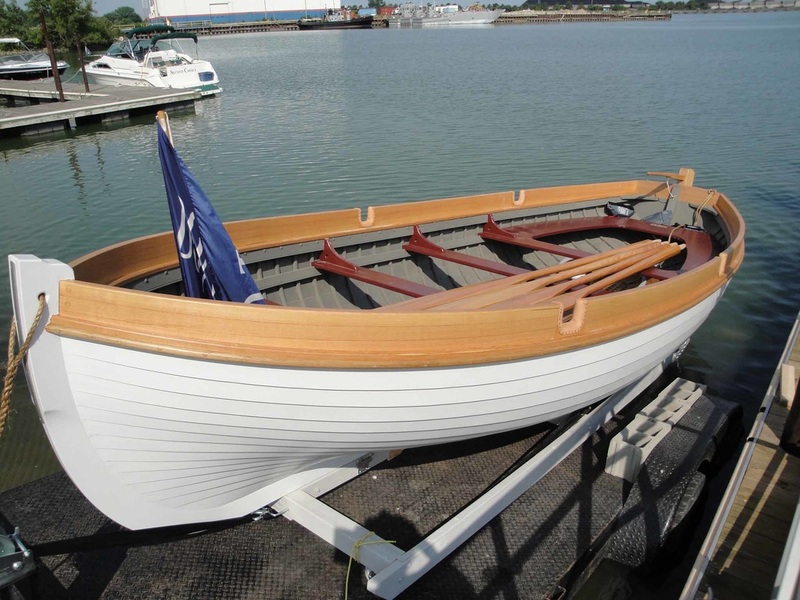 The boat was launched in June 2013, giving the crew some time to practice their rowing technique prior to the reenactment in September. However, the captain of the "Lawrence" on reenactment day determined that it was too windy and rough to put the boat and crew over the side and ultimately used a fiberglass dinghy with an outboard to make the transfer. It was a minor adjustment in an otherwise spectacular day. The boat remains on summer display at Perry's Monument at Put-In-Bay Ohio and winters at the Sandusky Maritime Museum in Sandusky, Ohio. We created the table of offsets from Melbourne Smith's drawings and Bob Reynolds at the Sandusky Maritime Museum lofted the lines full size. Meanwhile, we laminated the keel and transom blanks and generally prepared to begin fashioning parts as soon as the lofting was done. The only rabbet we required was cut into the sternpost and knee aft, fading into the keelson that provided the back rabbet for the garboards. The stem would have a separate outer stem piece so the back rabbet was cut in a simple taper. The molds were ready to go by the time the backbone was set up. 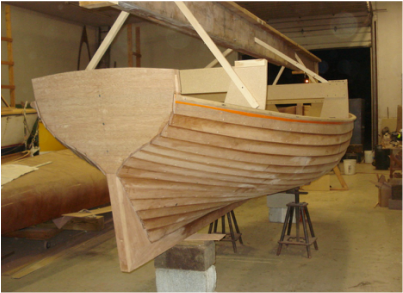 The molds are the forms around which the planking is bent that give the boat its shape. They are temporarily attached to the keel and braced to the strong back overhead. Accurate setup results in a fair hull built to the designed shape. The molds are derived from the full-size lofting and are assembled from two halves, sawn in pairs. They are carefully aligned on the keel, centered, plumbed and leveled in their respective locations. With the molds in place, planking can begin. 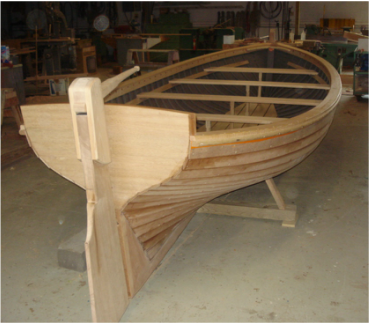 The hull is of glued lapstrake construction using marine plywood for the planking. 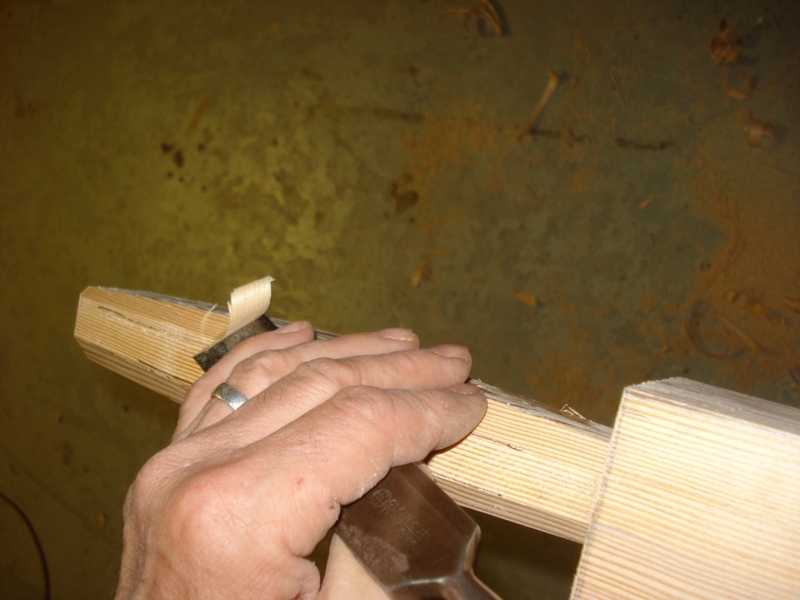 Each strake is made of a full-length blank and glued in place to the preceding one. 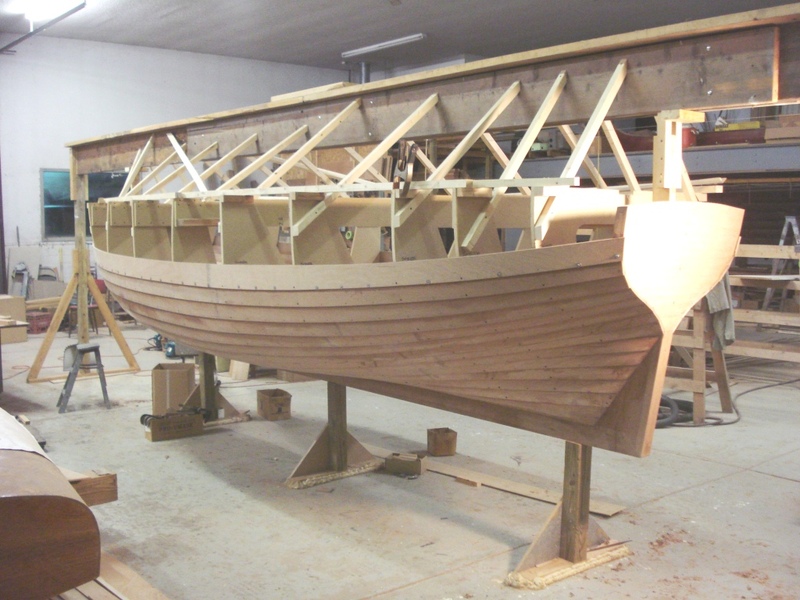 Each plank is of a unique shape and owing to the fine ends and full mid-section of this hull, some of the planks are quite 'crooked" when laid out flat. One of the less extreme examples is shown in the third slide from the end in this series. The outer stem is shaped and installed after the planking is trimmed off flush with the front face of the inner stem. The outwale blanks were backed out slightly for bedding compound before steam bending them to the sheers. After sealing with red lead primer, they were permanently bedded and fastened in place. The frames and sheer clamps were all steam bent as well. The frames were temporarily fastened hot. Later, they were removed and pre-painted with red lead primer and the interior paint color, then reinstalled with the permanent screw fastenings. The sheer clamps were just red-lead primed on their faying surfaces before being riveted through the outwales and frame heads. They would receive a varnish finish later. We glued wedges behind the frame heads to give a solid bearing against the sheer plank at the top of the frames where the sheer clamp bears. The rail caps are laminated full-length and installed in one piece with bedding compound and screws. Seats are simple plank seats with a center post under each and floorboards are made and installed in the traditional way. 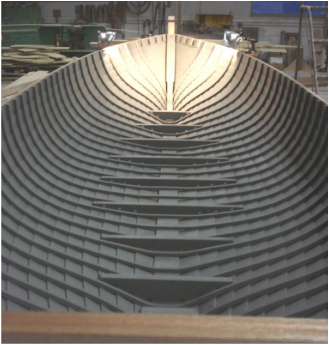 The washboards stand on edge atop the rail caps and are notched with leather lined "oar ports" that capture the oars and provide the fulcrum in the same way as oarlocks do on later rowing boats. The washboard blanks were laminated with a taper from bottom to top in cross-section and were then tapered in height from the middle toward each end. Because of the sweep of the sheer in profile, we cut the blanks apart lengthwise into 3 pieces that were then flexible enough to individually spring down into the sweep of the sheer. 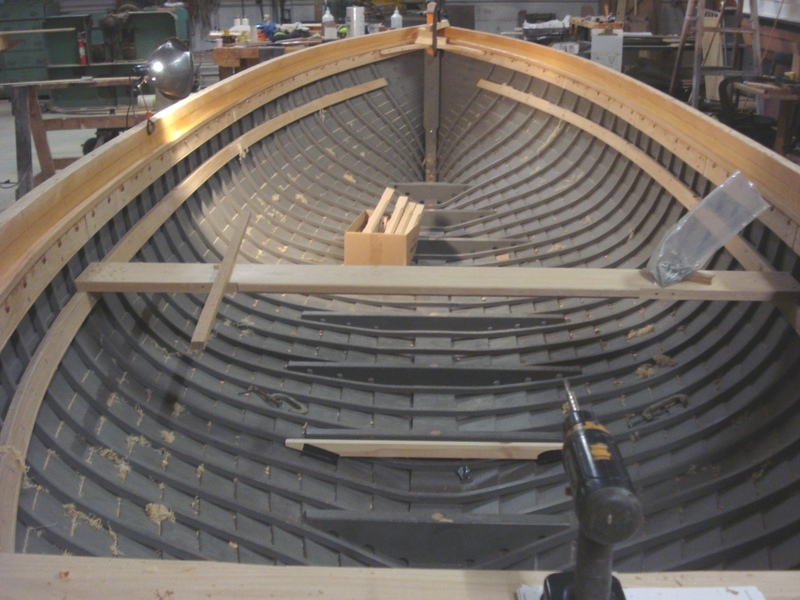 The first layer is bedded and fastened to the rail cap with each succeeding layer glued and screwed to the one beneath it, after which the oar ports were cut out.